A healthy lifestyle doesn’t mean you have to sacrifice your favorite foods (and pancakes are definitely one of my favorites!). 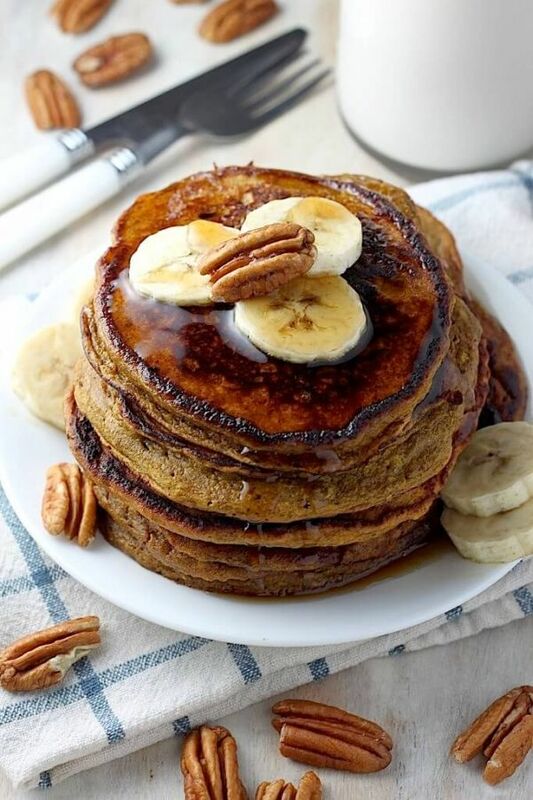 Not only are these pancakes healthy, but they’ll please even the pickiest palates. Whether your favorite ingredients are almonds, coconuts, or carrots, there’s a pancake recipe here for you. 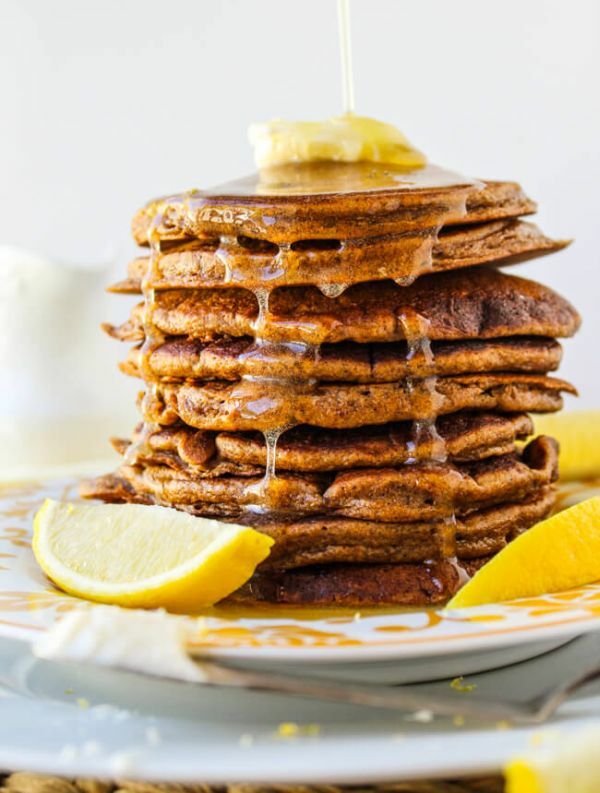 Mix up your meal plan with a whole new twist like gingerbread pancakes, bump up the protein by swapping protein powder for half of the flour, and if you’re looking for more flavor without a lot of butter or sugar, add in a dash of cinnamon, a little lemon zest, or a sprinkle of candied ginger. Oh and a little pancake protip: get some silicone pancake rings for making thick, moist flapjacks. Sometimes you just need thick pancakes with simple buttery flavor. 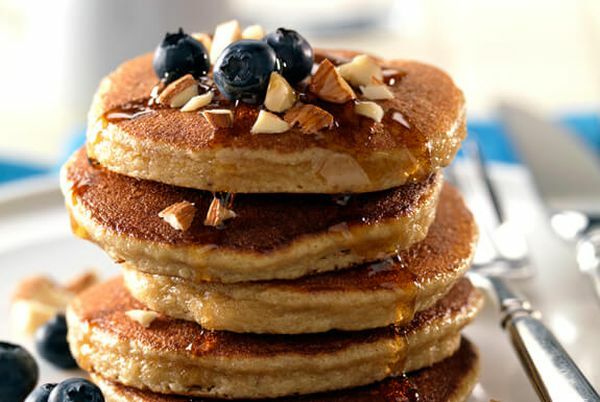 No fruit, no healthy substitutes like seeds, just fluffy pancakes to drizzle with real maple syrup. These buttermilk pancakes are even better than what you’ll get in a diner, and you don’t need ready-made mix. The batter is a simple mix of flour, buttermilk, and an egg. A dollop of Greek yogurt makes them thick. Then, a touch of butter, maple syrup, and vanilla extract round out the classic pancake flavors. 1/2 cup low-fat buttermilk, room temp. Here’s proof that healthy pancakes don’t have to be flavorless, just better balanced to ensure they deliver plenty of nutrition. Whole-wheat flour and ground oats are always a good choice since they add complex carbs, digesting slowly so your blood sugar won’t spike. 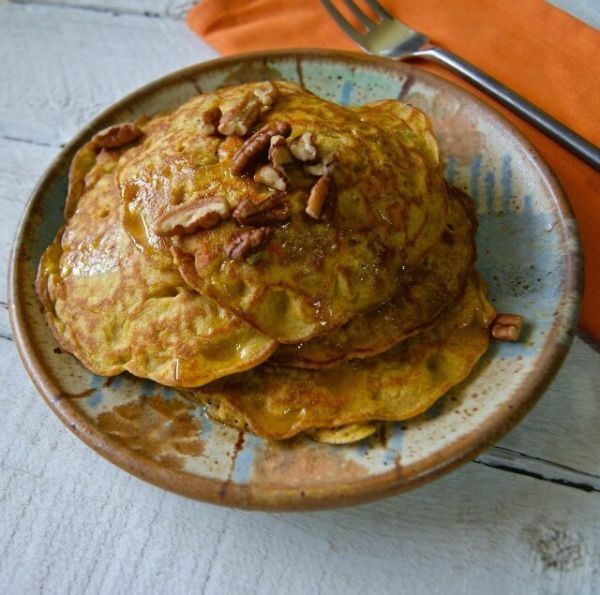 These pancakes have both Greek yogurt and pumpkin in place of oil, and almond milk shaves off a few calories. 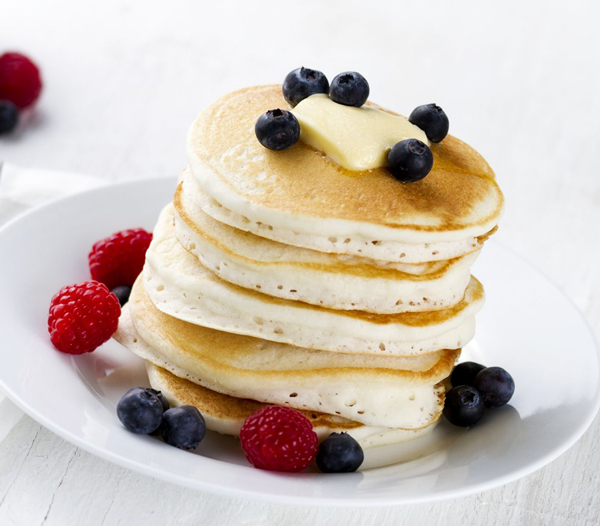 Pancakes don’t need to be full of simple carbs and empty calories. 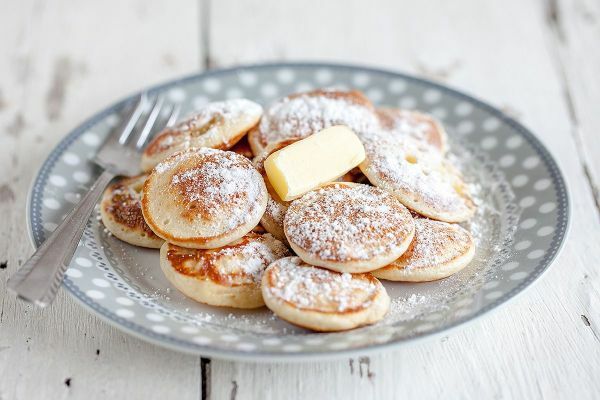 Make a thick batter using Greek yogurt and whole-wheat flour, and you’ll wind up with pancakes that are tastier and better for you than Bisquick. And the sugar is optional, so you can leave it out or substitute a sprinkle of stevia. Top with a dollop of Greek yogurt and a handful of fresh fruit, and you won’t even need the maple syrup. You’re an adult, which means you can have chocolate chips for breakfast whenever you want to. 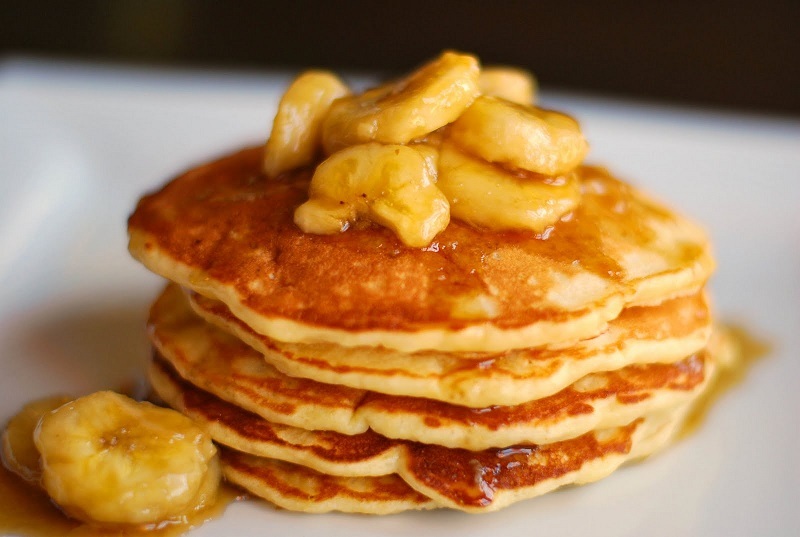 Adding a few to your pancake batter is hardly going to wreck your morning nutrition. Just take it easy on the maple syrup, or go for an alternative like PB2 syrup. Instead of slathering on thick peanut butter, mix up a pourable peanut syrup with 1/4 cup PB2, a teaspoon of honey, and cinnamon to taste. Add enough water to reach the desired thickness, about 2 to 3 tablespoons. These pancakes aren’t exactly health conscious, but they are traditional and – more importantly – super delicious. And since they’re small, they’re awesome to add to any brunch spread so that everyone can get a taste of pancakes without having a whole stack. It’s also fun to pile on other breakfast favorites like bacon, cheese, or fruit salad, treating these baby pancakes like finger food. Pancakes don’t always have to be a fallback brunch entrée. This recipe proves that pancakes can be stellar enough to serve on Christmas morning. They’re inspired by a traditional winter dessert: gingerbread. 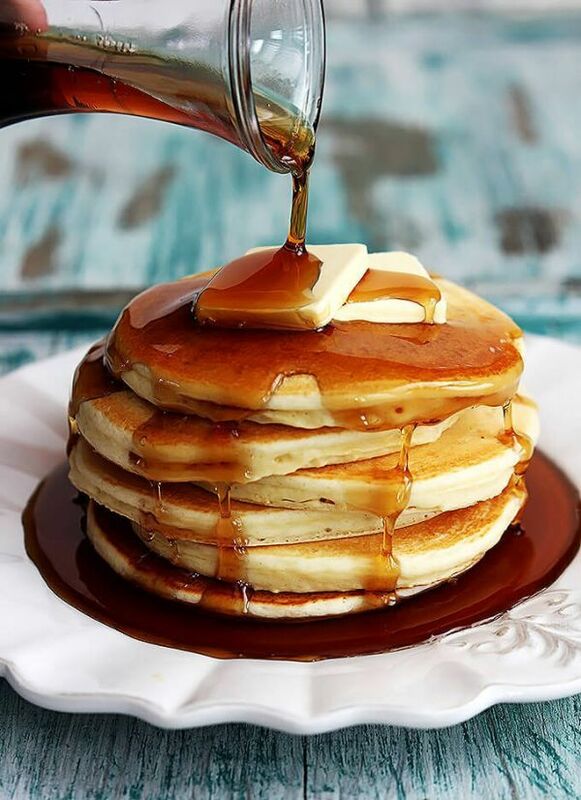 And although these would taste great with maple syrup, making a lemon-buttermilk syrup from scratch is a tasty alternative, and a drizzle makes these pancakes instantly gourmet. The recipe makes a ton of lemon syrup, so be sure to serve with no more than a quarter of the batch. Keep the rest in the fridge for up to a week. 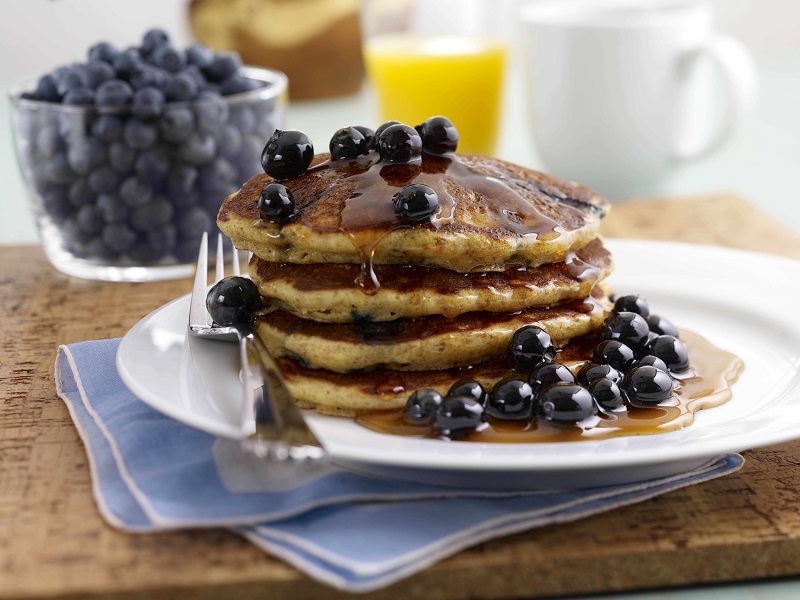 You can add blueberries to any pancake batter by gently folding them in at the very end. But for optimum blueberry flavor, it’s best to make a syrup from scratch. Syrup can seem intimidating if you start with granulated sugar because it can get grainy, but you can skip it and cook the blueberries in a mixture of apple juice and maple syrup. Serve with half the blueberry syrup, and you can save the rest for dessert. 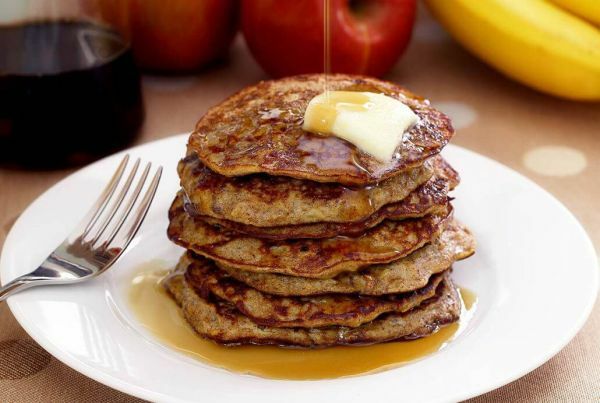 Apple pancakes are a delicious way to celebrate harvest season. In this recipe, almond butter enhances the flavor of the apples while adding some depth. 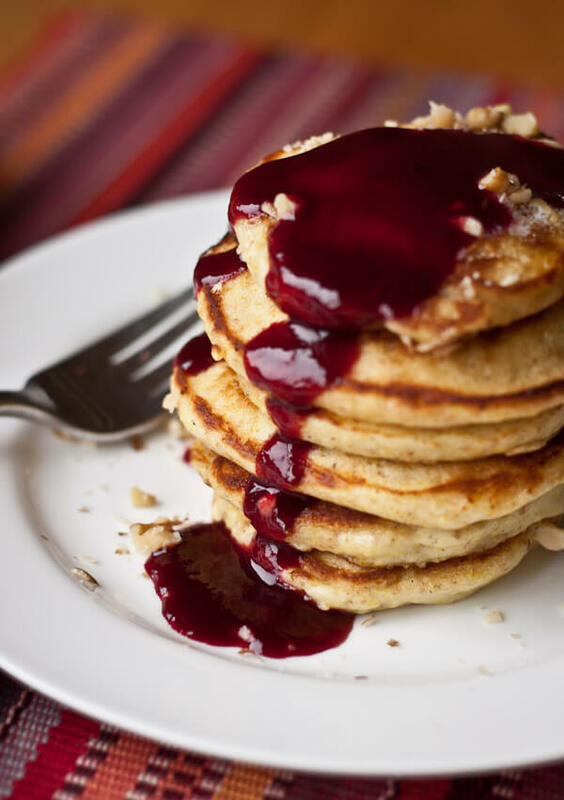 But maybe the best part is what isn’t in these pancakes: flour or oats. So you’re able to indulge while actually eating a big stack of fresh fruit, eggs, and almonds with no added sugar – except maybe some pure maple syrup. 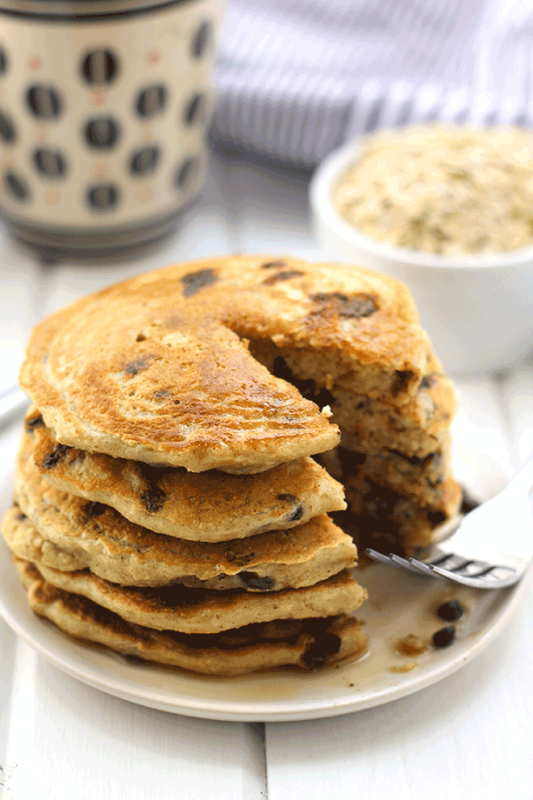 These oatmeal pancakes are lean with whole oats, low-fat cottage cheese, and egg whites. When you’re running low on time in the morning, dump all these ingredients in a blender. Then you just have to heat the pan, flip the pancakes, and eat. Just be sure to soak the blender bowl before you run out the door, or you’ll have a mess on your hands later. These could not be easier or better for you. All you need to do is mash a banana with a couple ingredients, and you’ll be eating in mere minutes. Once you see how easy these are to make, you’ll never go without a well-balanced breakfast again. 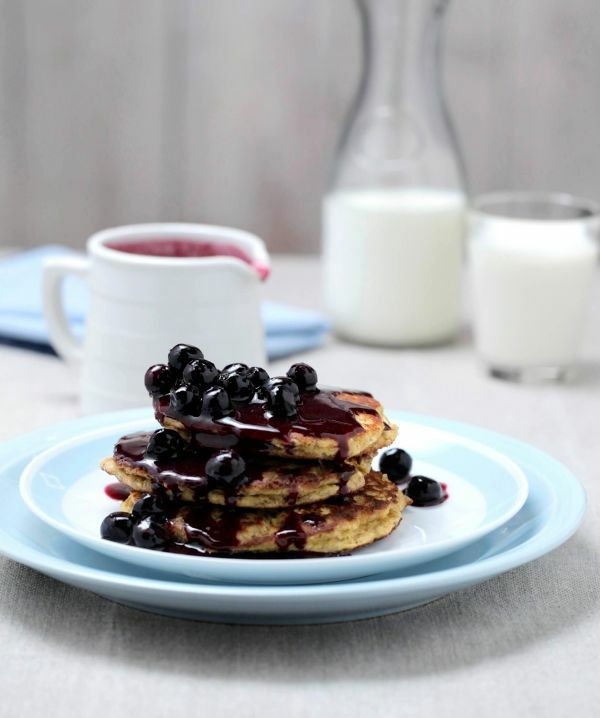 These pancakes are also the perfect base for mix-ins: crushed nuts, ground flax, blueberries – you name it. These chocolate pancakes are so rich they’re like having chocolate cake for breakfast. 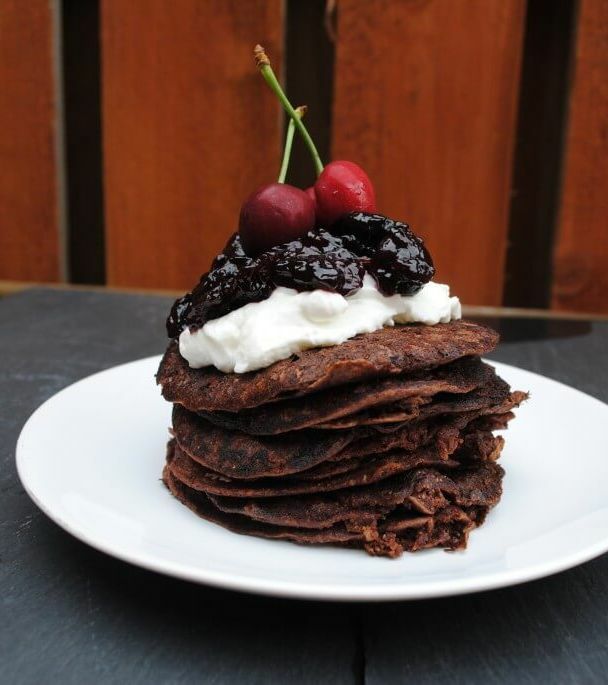 Yet you’ll find no added sugar in these chocolate pancakes, just the natural sweetness in the Natvia and cherries. All you have to do to turn the fresh fruit into a cake-worthy topping is mash them with the back of a spoon while you cook the cherries in a skillet. Leftover mashed potatoes from dinner can be repurposed for tomorrow’s breakfast, and if they’re loaded with sour cream and herbs, all the better. This doesn’t mean just sticking them in the microwave and grabbing a spoon, but using them as the base for a savory pancake batter. Just add an egg, shredded cheese, and a bit of flour. 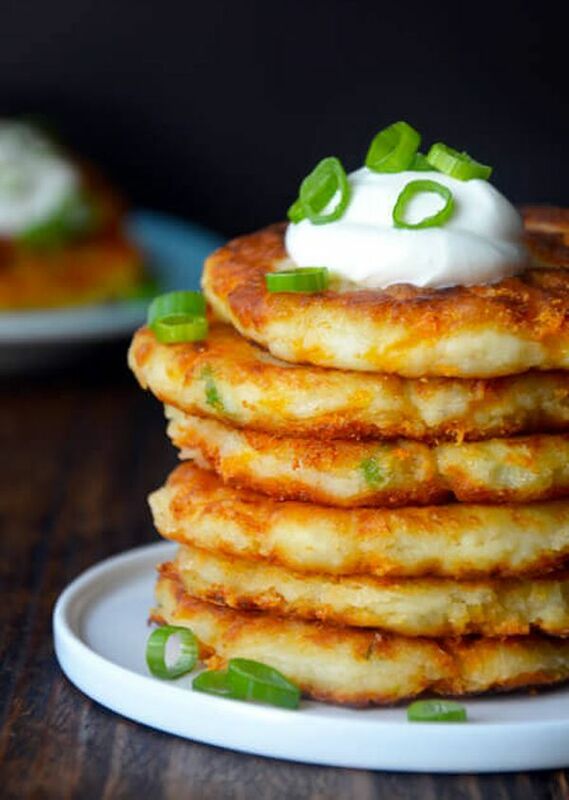 Then shape the potato pancakes, and fry them up. These taste like a traditional pancake, but they have an added crunch on the outside from the wheat germ. But that extra ingredient lends more than texture; wheat germ is chock full of vitamin B, fiber, and more. Somewhere in between pancakes and crepes land Swedish pancakes. That means you get the best of both, a very thin pancake that’s still light and fluffy. They have less flour than standard pancakes, which is good news if you’re watching carb intake. And this are a gluten-free pancakes since they use ground oats rather than wheat flour. Can you believe these red velvet pancakes are made with bananas and beets? So you can enjoy cake for breakfast while getting in plenty of nutrients, including vitamins and fiber from the beets. 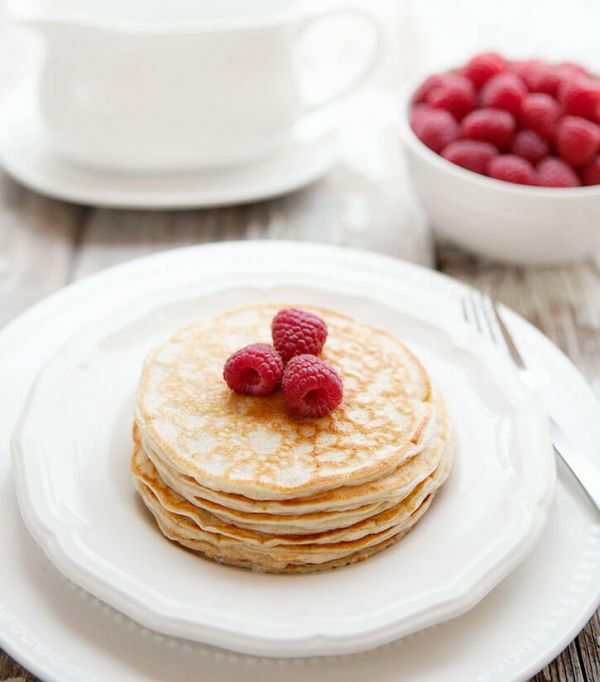 The pancake batter only needs a touch of sugar because of the natural sweetness, but you can reduce the added sugar even more with protein frosting. Rather than using maple syrup, add vanilla whey to the cream cheese frosting, and thin with milk. 2 oz. low-fat cream cheese, room temp. Cake for breakfast? Yes, you can . . . as long as you keep this vegan recipe on hand. With only 7 grams of sugar, there’s no reason to feel bad about sitting down to a decadent brunch when you’re having these pancakes topped with coconut whipped cream or whipped mascarpone and a dash of cinnamon. Take it totally over the top with a garnish of thin carrot chips and plump raisins. Anything with coconut is all the rage. With coconut water, sugar, oil, milk and flour now readily available, it would seem coconut has conquered all the staple ingredients. But what makes coconut flour so much better than traditional all-purpose? It has a lot of fiber, contains few carbs, and compared to almond flour, has surprisingly little fat. 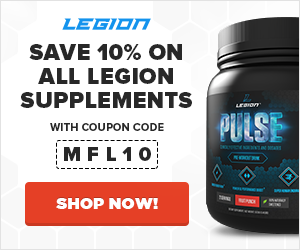 The two tablespoons in this recipe add 4 grams of fat, 5 grams of protein, and 17 grams of carbohydrates – 11 grams of which are insoluble fiber. These are pretty much the version of Saturday morning breakfast that you grew up with, but there are a few key changes to make them a lot less guilt-inducing. Most importantly, swap the white flour for whole wheat. If you don’t like the rougher texture, look for the bag labeled “whole wheat pastry flour.” Ground from the soft wheat berry, it has lower protein content but makes a fluffier pancake. This is a Paleo pancake recipe, but really it’s for anyone who enjoys almonds or unbelievably pillowy pancakes. And if you can never get enough of your favorite nut, take this recipe one step further by spreading roasted almond butter all over the top. 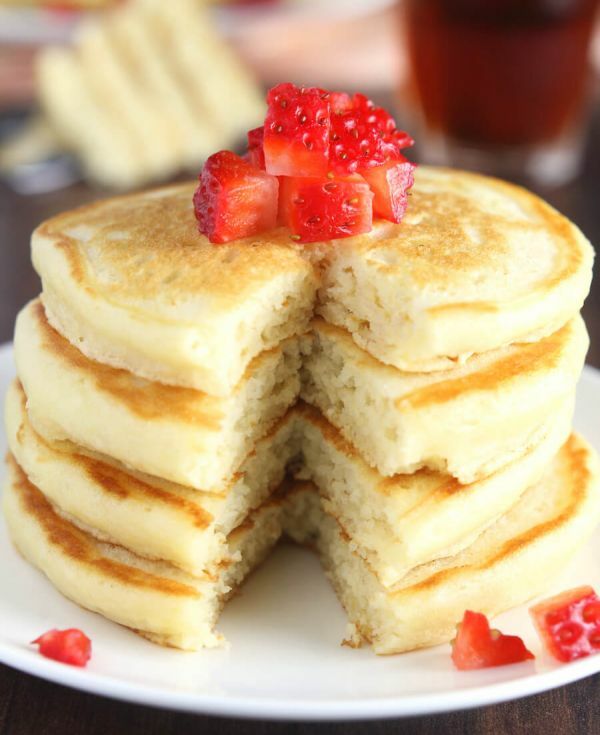 Have cake for breakfast with these low-carb pancakes. 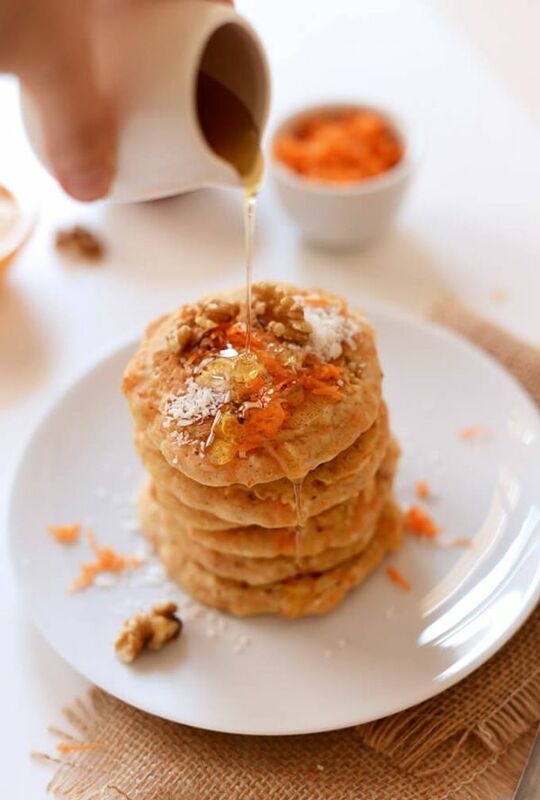 Since the recipe uses a mix of almond flour and coconut flour, most of the carbohydrates come from the carrots and a touch of maple syrup. To keep the carbs low, you’ll want to choose a different topping. 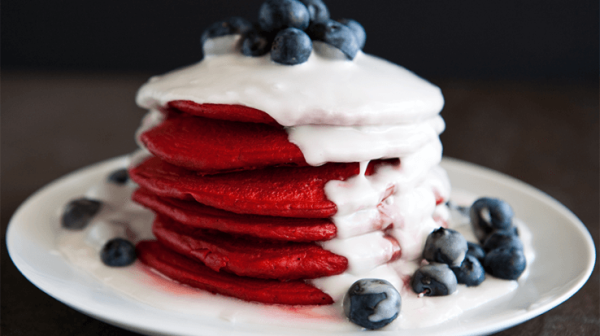 The cream cheese frosting from the red velvet pancakes would be the perfect finishing touch. 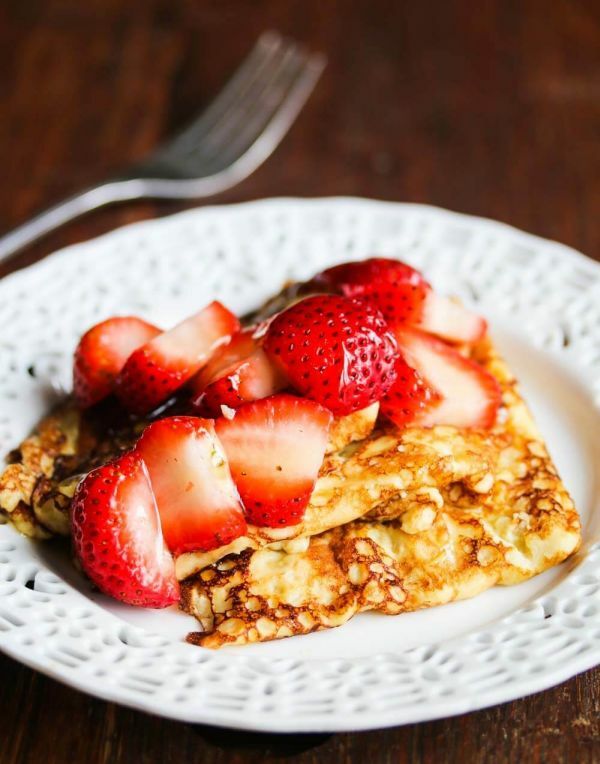 What did you think of these healthy pancake recipes? Have anything else to share? Let me know in the comments below!